The musicians: Charley Perez – Percussions, Eli Sruya / Menahem Amar – Oud. 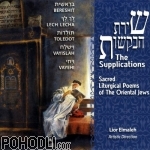 "The Supplications" is a wide and comprehensive project, perpetuating traditional religious poems of the Sephardi Jews, performed by the greatest vocalists of our time. This project took 3 years to realize and this is the first out of 4 volumes. Many of the poems are sung Acappella – each time by a different singer and some of them have an accompaniment of a single instrument such as the Oud or percussion. The Back ground for the Jewish Supplications (Baqashot). The Baqashot are a collection of supplications, songs, and prayers that have been sung for centuries by the Sephardic Aleppian Jewish community and other congregations every Shabbat morning from midnight until dawn. Usually they are recited during the weeks of winter, when the nights are much longer. The custom of singing Baqashot originated in Spain towards the time of the expulsion, but took on increased momentum in the Kabbalistic circle in Safed in the 16th century. Baqashot probably evolved out of the tradition of saying petitionary prayers before dawn and was spread from Safed by the followers of Isaac Luria (16th century). With the spread of Safed Kabbalistic doctrine, the singing of Baqashot reached countries all round the Mediterranean and became customary in the communities of Morocco, Tunisia, Algeria, Rhodes, Greece, Yugoslavia, Egypt, Turkey and Syria. It also influenced the Kabbalistically oriented confraternities in 18th-century Italy, and even became customary for a time in Sephardic communities in western Europe, such as Amsterdam and London, though in these communities it has since been dropped. By the turn of the 20th century Baqashot had become a widespread religious practice in several communities in Jerusalem as a communal form of prayer. Stránka vygenerována 23.4.2019 v 03:04:09 za 0.161 sekund.